By Rachel Held Evans, on August 08, 2011. I’ll be sharing a little more about my trip in the weeks to come, but today I need a break. Thankfully, Jana Riess did a fantastic job responding to your questions about Mormonism as part of our summer interview series. Jana is the author or co-author of nine books, including What Would Buffy Do? and the forthcoming memoir Flunking Sainthood. She has a Ph.D. in American religious history from Columbia University and an M.Div. from Princeton Theological Seminary. You can follow her on twitter. Her Beliefnet blog, Flunking Sainthood, deals with Mormonism, popular culture, and whatever she happens to be reading. From Christin: It sounds like you converted to the LDS church from mainstream Christianity. What was it about the Mormon faith that resonated with you enough to convert? Oddly, I converted to Mormonism when I was enrolled in a Protestant seminary studying to be a pastor. I was 23 years old. I would say that my conversion, like most other people’s, was a combination of push and pull factors. For me a major push factor was studying Protestant theology and coming to realize that I didn’t believe in the Trinity. This was a serious problem; how could I become a minister when I had no conviction about this key point of doctrine? I wished very much that I could believe in the Trinity, because I love the idea of God in relationship – that a relationship among equals is in fact the defining feature of God’s identity. However, the three-in-one concept never quite added up for me. The pull factor was that I had been studying Mormonism academically since the middle of college and, after two solid years of reading, had an unexpectedly powerful spiritual experience with the Book of Mormon not long after graduation. Even after that, I continued trying to stay Protestant and on the path to ordination, but there was always this tug. I was reading all the time about Mormonism—everything I could get my hands on, including anti-Mormon literature. It took me two full years to be baptized into the LDS Church. I am not an impulsive person, and I had many questions and also some serious stumbling blocks, like the role of women in Mormonism (which I’ll get to below) and what I saw as a very troubling racist history in the religion’s not-so-recent past. But when I prayed about these things I received a pretty unmistakable confirmation that I was supposed to take a leap of faith despite my questions. Over time I have come to love many aspects of Mormonism that I didn’t know about then – like that the church’s structure forces people to attend the local congregations where they live, which enhances social and racial unity. Mormons don’t have the luxury of church-shopping, or attending church with only those people who agree with us politically or inhabit our same socioeconomic bracket. I also love the emphases on building strong eternal families and aiming to emulate the life of Christ, which are things that we share with many other Christians. Many readers had questions about what it is like to be a woman in the LDS Church. What are some of the benefits to being a Mormon woman, and where do you see room for improvement? Well, you hit right upon my personal Waterloo. Being a Mormon woman is both marvelous and extremely frustrating. It’s marvelous because we believe that all human beings are spiritual daughters of God and share in God’s divine nature; that Eve was a heroine who contributed to the plan of salvation rather than a temptress who was responsible for the fall of man (and I use “man” quite literally here); and that we have a Mother in Heaven as well as a Father. All those are theological truths that I wholeheartedly embrace. Mormon women do not have the priesthood.… A Mormon woman cannot preside over a sacrament meeting, be called as a mission president, seek ecclesiastical forgiveness from another woman, serve as a ward Sunday School president, teach Institute while she has children at home, or pray to her Mother in Heaven. So, it’s a mixed bag. I make my peace with it and try to contribute to positive change because I love my Church, warts and all. From Teri: What's the deal with the planets? Does God really live on a planet? Do faithful Mormon men really get their own planets? Does that mean they become gods? I've been hearing little bits and pieces of this since I was in high school (in a place with a large Mormon population) and it's always been so confusing. Throughout Mormon history, various church leaders have made statements about what Protestants would consider a particularly expansive idea of the afterlife. Mormons believe in a very active, powerful concept of the afterlife. The Mormon heaven is not passive. Some leaders have stated that those who attain the highest level of heaven will be responsible for building and governing worlds, which is another level of becoming like God, our model in all things. However, and this is a big caveat, I would caution that governing our own worlds is something that in 18 years of being Mormon I have heard exactly once in a church meeting. It’s something that anti-Mormon literature ALWAYS brings up, but it’s something that I hear actual Mormons talk about mostly in the context of Mormon history. It is still a Mormon teaching, but it’s hardly a leading doctrine for Mormons today, who generally talk about the afterlife as a time to meet God and be reunited with beloved family members. From Ellen: Can you list several core beliefs that you hold in common with other Christians? Can you list several core beliefs of Mormonism that are different (either subtly or hugely) than those held by other Christians? One shared core belief is that Jesus Christ, the Son of God, died for our sins, and that his atonement makes it possible for humanity to be reconciled to God. This is why Mormons so stubbornly insist that we are Christians, even though we’re not Trinitarians. But for many Protestant, Catholic, and Orthodox Christians, belief in the Trinity is the dividing line that determines whether a person can be considered a Christian. Mormons share a belief in the Bible as inspired Scripture, but add to it three other works that are considered part of the LDS canon: the Book of Mormon, the Doctrine and Covenants, and the Pearl of Great Price. So naturally, some Christians are concerned that the Mormon canon is different and larger – and that Mormons regard the current president of the Church as someone authorized to receive revelations from God that are sometimes accorded the same status as Scripture. On a personal note, since I am married to a Protestant and am active in his church community, I would say that it is a mistake to exaggerate the theological differences that exist between creedal Christians and Mormon Christians. I believe that we are one body in the family of God, and that it is paramount to build bridges between religious communities so that we can learn from one another. I have learned so much from my interactions with friends from other religious perspectives. We can all strive to better understand each other and love one another despite our very real differences. From Laura: From the outside perspective, it seems the Mormon church holds very firm stances on certain issues and then will suddenly reverse course, especially in the cases of polygamy and institutionalized racism. This makes it appear to outsiders as if God is changing His mind. How is this explained from within the Mormon church? I imagine that I have a more human view of prophetic inspiration than some Mormons do, since I am a historian who sees prophets as very much creatures of their times as well as people who are inspired by God – much like the prophets of the Old Testament. I also think that prophets can sometimes be wrong, and that this was the case with the refusal to grant blacks the priesthood until 1978. That was a profound moral injustice, period. And interestingly, it wasn’t even true to the wishes and example of founding prophet Joseph Smith, who ordained a black man, Elijah Abel, to the priesthood as early as the 1830s. From April: I am curious about the very secretive things that happen in the Mormon temple. I have a friend who attends a Christian reformed university with me and we always discuss how similar he feels Mormonism is to mainstream Christianity, but then I get confused when he says there are things that he's not allowed to discuss. If, (and please forgive me if I am wrong), Mormons believe that we are all members of the body of believers then why would there be secrets that you couldn't share with other, non-Mormon, Christians? That’s a great question. To give some background, Mormons have regular church buildings called chapels where we go for meetings on Sunday and activities during the week. But we also have holy temples – currently 134 of them around the world – where we go for special rituals, including baptism for the dead, eternal marriage, washings and anointings, and the endowment ceremony. Probably it is this last ritual that you’re referring to. 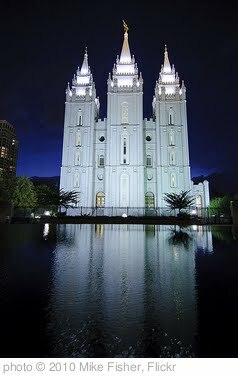 Mormons who have received their endowments vow to discuss the endowment only with other Mormons inside the temple itself, which is considered to be our holiest space. There is a saying in the Church that temple rituals are “sacred, not secret,” but this is nonsense; it’s both. Anytime you are instructing people not to discuss something, that’s called a secret. Mormons should call a spade a spade. I love the last part of your question about how secrecy might drive wedges between Christians. I would say that it can and does, and yes, that is troubling to me. But I’m going to speak from a Mormon’s perspective and respond that we see our faith caricatured every single day by people who call themselves religious. I wish I could communicate to you the pain that many Mormons feel when we hear our beliefs mocked, from people saying we wear “magic underwear” to people claiming that Mormons are plotting to take over the government of the United States. (Yes, some people actually believe this.) There’s a lot of suspicion and even outright hatred of Mormons, which is sad. Is it any wonder that we don’t want the most sacred ritual of our lives to be similarly ridiculed and stomped on? One reader noted that the reported history of the Book of Mormon has been seriously called into question by archeology. Is it respected in your faith to interpret that content symbolically, or is everyone supposed to literally believe it? I would say that most Latter-day Saints see the Book of Mormon as a historical record, and that this view is encouraged by LDS leaders. 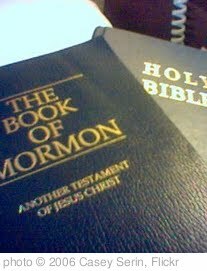 There are also some Mormons who see the Book of Mormon as a divinely inspired book that is intended to guide and instruct but not to be interpreted as a historical record. It’s not just archaeology where historical questions have been raised; it’s also the lack of DNA evidence to verify the longstanding interpretation that contemporary Native Americans and Mesoamericans are descended from ancient Israelites. Mormon apologists have offered some very helpful and challenging counter-arguments to address these controversies – you can see some of them here. What I wish is that more people would actually read the darn book and try to understand it on its own terms. There is some beautiful wisdom there, which can and does change lives. It changed mine. Check out King Benjamin’s sermon in the Book of Mosiah, or the discussion of faith in Alma 32. Some great supplementary books are Terryl Givens’s By the Hand of Mormon, which is a cultural history of the book and its reception, and Grant Hardy’s Understanding the Book of Mormon, which is a literary interpretation of the text. Both are from Oxford University Press and are available on Amazon. From Hannah: An assertion I see frequently online is that being a Mormon living in Utah is very different to living in other areas of the US, obviously because of the high population, but also because of the culture it has created and the pressure on members to live up to certain standards, 'keep up with the Joneses' etc. I have often seen Mormons say that living in Utah actually made them quite miserable, whereas some high profile Mormon bloggers and personalities portray it as the happiest place on earth. Do you think it there a kind of 'love it hate it' culture/atmosphere there, which doesn't exist for Mormons in the rest of the US and indeed in the world? The timing of this question is funny – I am in Utah as I write this, attending two conferences and visiting friends. I don’t live here, and I suppose I always carry a slightly naïve idea of what it might be like to live in an area where Mormons are not the extreme minority. Well, last night a speeding driver smashed into my rental car and then just drove away without exchanging insurance information or seeing if I was OK. I was seriously angry about this (!) . . . and also sad to think that statistically, that jerk may well have been a Mormon. Mormons are not perfect, not by a long shot. And frankly, I think that living in Utah would be difficult in many ways. It’s definitely more conservative there, and that would be hard for me. Sometimes it’s tough to be such a small minority (Mormons are 2% of the population nationally; less than 1% where I live), but it’s also very freeing. There is greater tolerance for different points of view within Mormonism where I live -- precisely because we are such a tiny minority outside of the Wasatch Front and we need every single person who’s willing to serve. We can’t afford to judge each other! I don’t think I’ll be moving to Utah anytime soon. I hear it’s not a safe place to drive your car. ;-) Also, it’s exhilarating to live and work among people with all different beliefs. I have been so enriched by that. Just for fun: Tell us about your dog! ...Everyone, thanks so much for this opportunity! I’ve enjoyed your questions and appreciate your friendly tone as we engage in dialogue. Please understand that I have answered the questions as an individual Mormon and not an official representative of any kind. Thanks so much to Jana for her thoughtful responses!